Polaris, also known as the North Star, Alpha Ursae Minoris or Star of Arcady, is the brightest star in Ursa Minor constellation. Polaris is notable for currently being the closest bright star to the North Celestial Pole. The pole marks true north, which makes the North Star important in navigation, as the star’s elevation above the horizon closely matches the observer’s latitude. The North Star has a reputation for being bright, but it is not among the top 10 or even the top 40 brightest stars in the night sky. It is only the 48th brightest star, and owes its reputation to the fact that it is the nearest relatively bright (second magnitude) star to the North Celestial Pole. Polaris is also the star that marks the end of the Little Dipper‘s handle. It is approximately 434 light years or 133 parsecs distant from Earth. Polaris goes by many different names, including the Northern Star, Pole Star, Lodestar, Guiding Star, and Cynosūra, derived from the Greek κυνόσουρα for “the dog’s tail.” In ancient Greek times, Ursa Minor was taken to represent a dog, not a bear. Alpha Ursae Minoris is slightly off the pole, making a circle around it roughly 1.5 degrees across. As a result of the 26,000 year precession of the Earth’s axis, the celestial pole is currently moving closer to Polaris. Once it reaches the separation of 14 arc minutes around the year 2105, the pole will start to move away from the star again. Eventually, another star will take over as the navigational benchmark for true north. Because the Little Dipper is not bright enough to be seen from areas where there is too much light pollution, the easiest way to locate the North Star is by using the stars of the bigger and brighter Big Dipper in the nearby Ursa Major constellation. The stars Dubhe and Merak in Ursa Major, also known as the Pointers, are the easiest way to find Polaris. These are the two bright stars that outline the outer part of the bowl of the Big Dipper. An imaginary line through these stars leads directly to the North Star. Polaris is located at about five times the distance between the Pointer stars. It is the first bright star in that direction. The Big Dipper completes a circle around Polaris every 23 hours and 56 minutes, with the Pointer stars always pointing toward the North Star. The only nearby bright stars that are readily seen are Kochab and Pherkad, which are also part of the Little Dipper. The two stars are known as the “Guardians of the Pole” because they appear to march around the North Star like sentries. Polaris marks the end of the handle of the Little Dipper, or the tip of the tail of the Smaller Bear. The stars of the Little Dipper are relatively faint and can only be seen without binoculars in good conditions, with clear skies, no light pollution, and little or no moonlight. Polaris lies almost in a direct line with the Earth’s rotation axis, which is to say almost exactly “above” the North Pole. The star is almost motionless, with all the other stars in the northern sky seemingly rotating around it. The North Star never rises or sets at night, but stays in almost the same position above the northern horizon throughout the year, while other stars appear to circle around it. For observers at the North Pole, the star lies directly overhead. For observers in New York, it stands 41 degrees above the northern horizon, which corresponds to the latitude of the city. For observers at the equator, Polaris sits right on the horizon. The star clmbs higher in the sky the farther north you go and drops below the horizon for observers in the southern hemisphere. Polaris was used as the pole star by navigators at least from Late Antiquity. It is currently 0.7° away from the pole and revolves around it in a small circle about one and a half degrees in diameter. Polaris wasn’t always the North Star. Around the year 2500 BC, the celestial pole was near Thuban, located in the constellation Draco. Around the year 400 BC, the pole was closer to Kochab, Beta Ursae Minoris, than it was to Alpha UMi. Around the year 14,000, the much brighter Vega in Lyra constellation will be the nearest star to the pole. Polaris will make its closest approach to the pole on March 24, 2100, when it will come within only 27.15 arc minutes of it. After the 21st century, the celestial pole will move away from Polaris and, by the 41st century, it will come near Gamma Cephei in Cepheus constellation. Unlike the North Celestial Pole, the pole in the southern hemisphere doesn’t have a bright star close enough to be called the pole star, nor will it have one for the next 2,000 years. The nearest star to the south pole is Sigma Octantis, located in Octans constellation. With a visual magnitude of 5.45, it can barely be seen without binoculars, which doesn’t make it very useful in navigation. 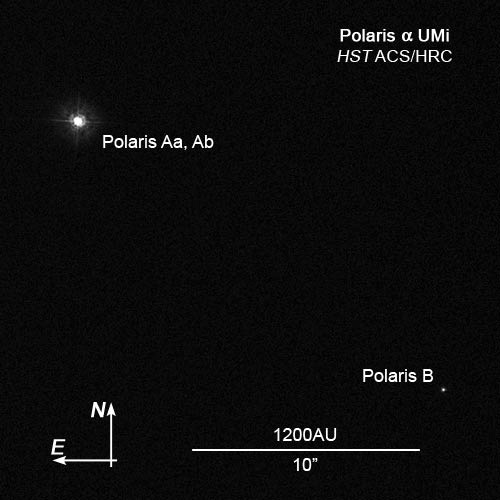 Polaris is not a single star, but a multiple star system. The main component, Alpha Ursae Minoris Aa, is an evolved yellow supergiant star belonging to the spectral class F7. It is 2,500 times more luminous than the Sun, 4.5 times more massive, and has a radius 46 times that of the Sun. The star is classified as a Cepheid variable, showing pulsations over a period of about four days. 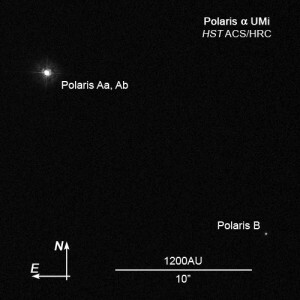 Polaris A is a classic Population I Cepheid variable. It is the brightest Cepheid variable in the sky. Cepheid variables are stars that astronomers use to measure distances to galaxies and clusters. The North Star’s brightness varies by 0.03 magnitudes over a period of 3.97 days. Its variability had been theorized since 1852, but was not confirmed until 1911, when the Danish astronomer Ejnar Hertzsprung confirmed the variation. Polaris A’s amplitude and period of the variations have not remained the same since discovery. Before 1963, the amplitude was more than 0.1 magnitude and slowly decreasing. It decreased quite rapidly after 1966 until it reached 0.05 magnitude, and has been erratic but stayed neared that range since. The period of the variations increased more or less steadily until 1963, when it remained constant from 3 years, and then started increasing again. Currently, the measurements show a steady increase of 3.2 seconds per year. 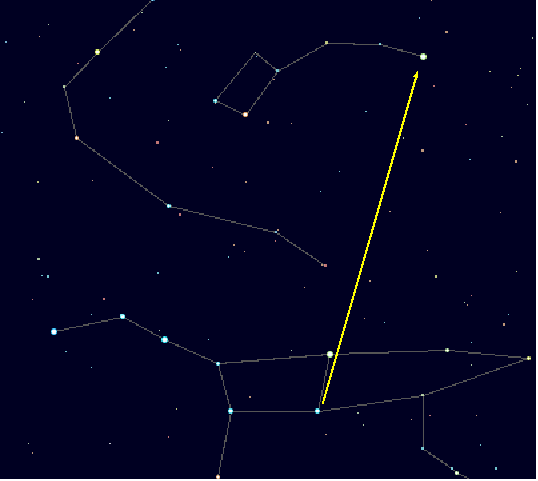 Diagram showing how to find the star Polaris by following the pointer stars in the Big Dipper. Alpha Ursae Minoris Aa has two companions. The one closer to the supergiant, designated Alpha Ursae Minoris Ab, is a dwarf belonging to the spectral class F7. It lies at an average distance of 17 astronomical units and has an orbital period of about 29.6 years. The star has a highly eccentric orbit that takes it between 27 and 6.7 astronomical units from the primary component. The star further away from the supergiant, designated Alpha Ursae Minoris B, lies 18 arc seconds away. It is a dwarf star with the stellar classification F3 1.4. It is at least 2,400 astronomical units away from Polaris A and has an orbital period of at least 42,000 years. Polaris B was discovered by William Herschel in 1780. It can be seen in a modest telescope. Polaris also has two more distant companions, Alpha UMi C and Alpha UMi D.
Polaris is the brightest in a small semicircle of stars known as the “Engagement Ring.” The stars lie within a field which is six degrees wide. The North Celestial Pole lies roughly halfway between Polaris and Lambda UMi. The binary nature of Polaris A was confirmed in 1929 after an examination of the star’s spectrum. All three components in the star system were revealed in Hubble images in January 2006. Polaris may be 2.5 times brighter today than when the Greek astronomer Ptolemy observed the star, according to a recent research led by Scott Engle of Villanova University in Pennsylvania. The research, based on historical records and presented in a poster session at the American Astronomical Society meeting in Washington, D.C., in January 2014, has revealed that the star has changed from third to second magnitude since Ptolemy’s times. Engle and his team used historic measurements of the star by Ptolemy in the year 137, the Persian astronomer Al Sufi in 964, the Danish astronomer Tycho Brahe in the 16th century, and others.